How is the advertising landscape changing? Is spend increasing? How quickly are digital channels growing? Which formats are on the rise? 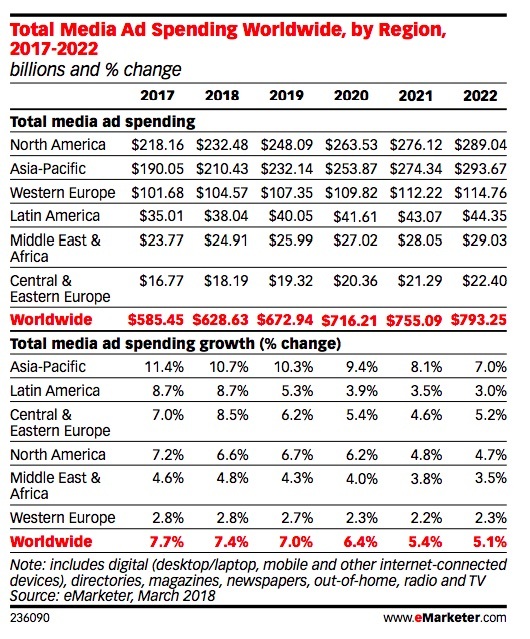 Two recently released reports—eMarketer’s Global Ad Spending Forecast and Zenith’s Advertising Expenditure Forecasts—do an excellent job of thoroughly analyzing current global data to tackle these questions. 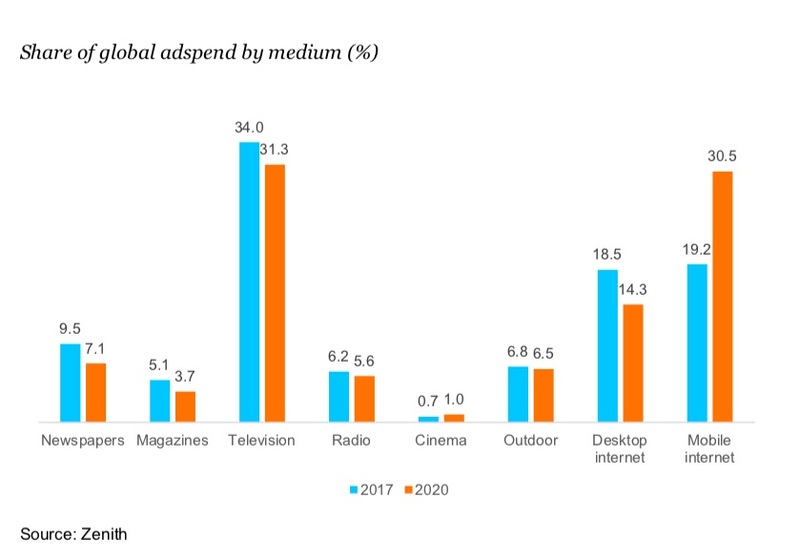 The first important finding from the research is that advertising spend is growing at a healthy clip and that this is expected to continue in the coming years. 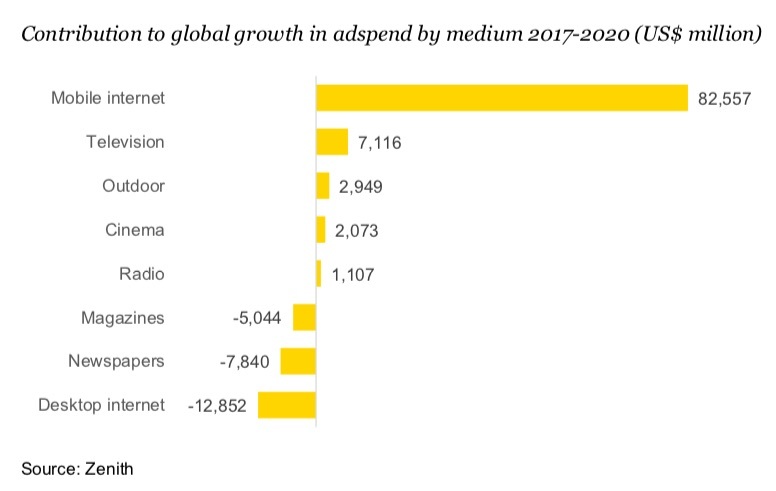 The eMarketer researchers forecast that worldwide ad spend will increase by 7.4% this year, 7% next year, and 6.4% in 2020. What’s driving this steady growth in ad spend? A relatively healthy global economy. 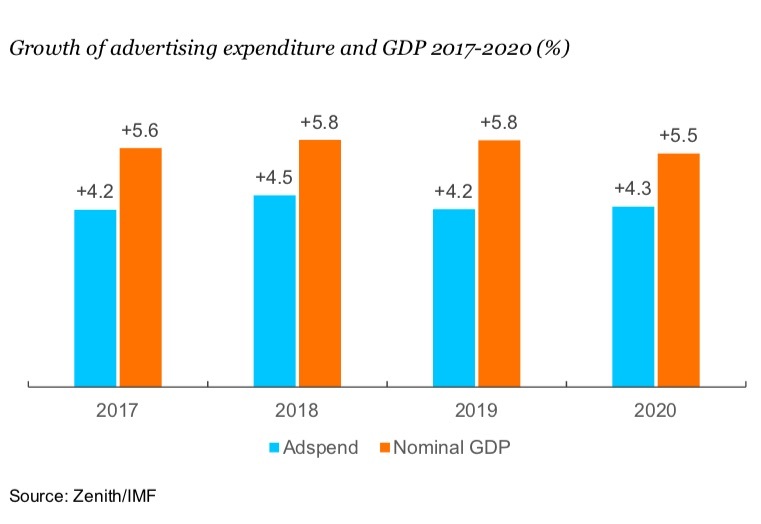 As Zenith notes, the current and projected future ad spend increases map closely to expected GDP growth across countries. Overall, this growth is good news for brands. It signals that markets are expected to remain healthy and that demand for products/services should build. However, it also means increased competition on ad channels and potentially higher prices. The reports show that global ad spend growth has not been spread evenly across countries. 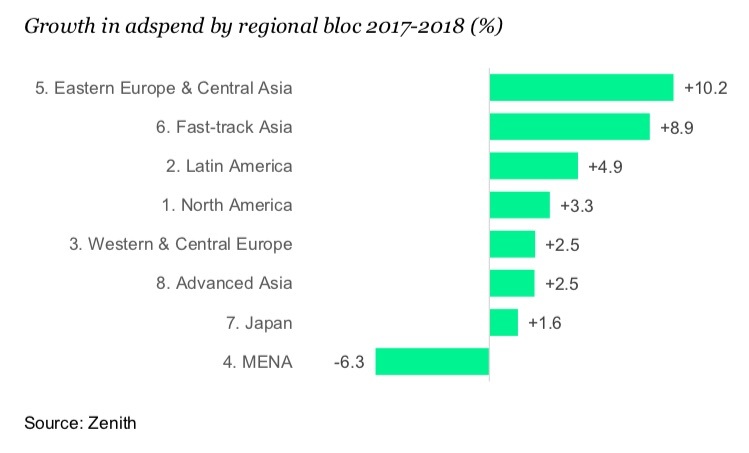 For example, over the past year, some regions such as Eastern Europe and Central Asia have seen double-digit growth in spend while others have seen minimal increases or even decreases. 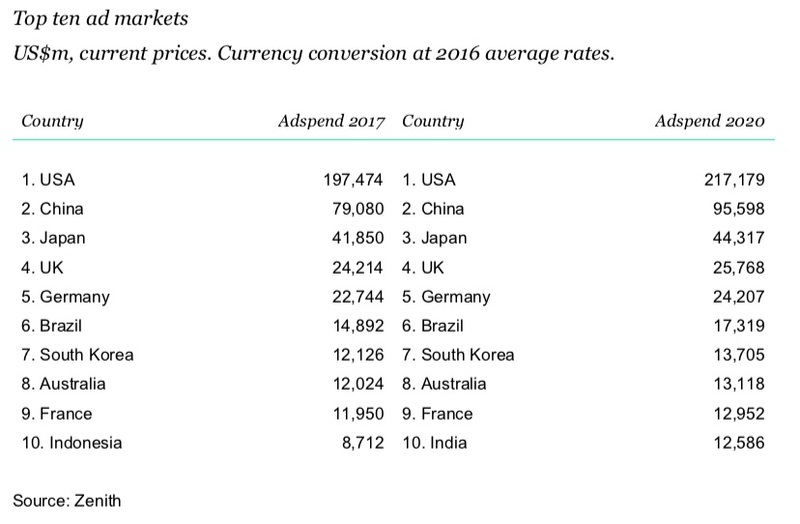 However, while ad spend in other countries is expected to grow more quickly, the U.S. advertising market will remain the largest in the world, by far. 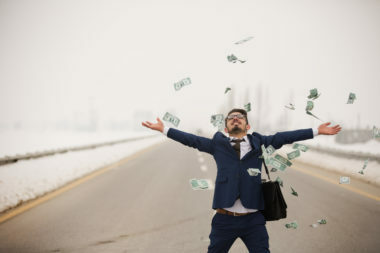 In fact, Zenith estimates that in 2020, advertising spend in the United States will still be more than double the advertising spend in China. The important takeaway here for U.S.-focused brands is that the domestic advertising market remains huge, with plenty of scale to power both new and existing channels. Remember when digital was an ancillary part of advertising strategies? The eMarketer report forecasts that digital will account for 43.5% of all advertising spend this year and 47% next year. 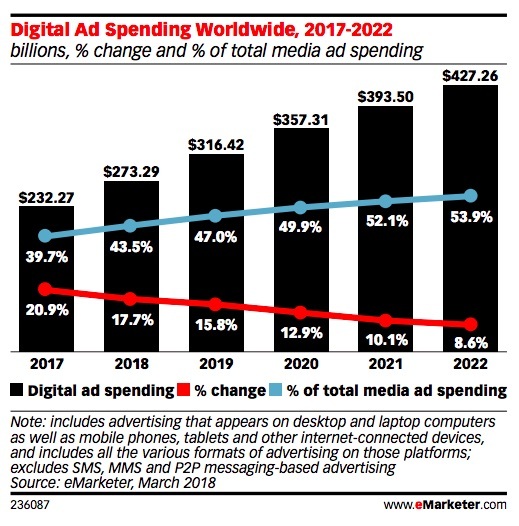 And the shift is expected to continue: by 2021, the majority (52.1%) of global advertising spend will go to digital channels. For brands, these numbers reinforce something that has become increasingly evident over the past few years: any advertising strategy that does not prioritize digital channels is outdated. 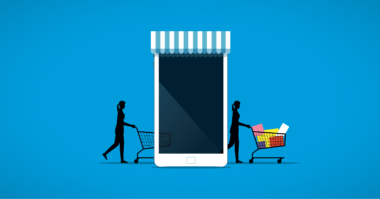 Another major shift that’s highlighted in both reports is that digital advertising is increasingly synonymous with mobile advertising. 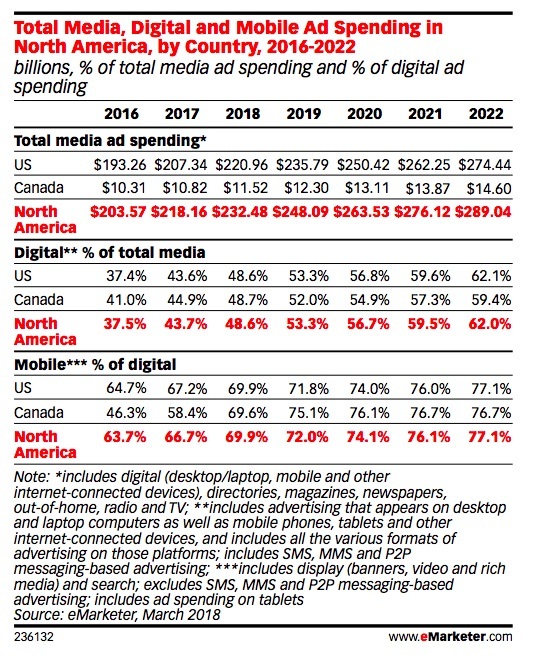 The eMarketer researchers note that 70% of digital ad spend in North America will go toward mobile this year and 72% will go toward mobile next year. By 2022, that share will increase to 77%. Given this clear trend, it’s critical to ensure that mobile is front and center as you plan your advertising strategy next year and beyond. The rapid growth of mobile advertising is truly breathtaking: Zenith forecasts that it will power nearly all of the increase in spend through 2020. However, the fact that one medium is growing rapidly doesn’t mean that the others are collapsing. 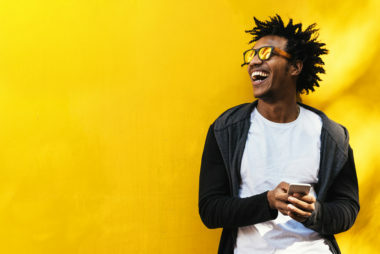 While mobile is set to spike in the coming years, spend on many traditional channels such as television, radio, and outdoor is expected to remain both large and relatively stable, according to Zenith’s forecast. Ultimately, what emerges from the research is that advertisers should be optimistic and nimble. The coming years should bring plenty of opportunity, but also major changes. It’ll be important to be hyper-aware of the big ad shifts—specifically toward digital and mobile—while not abandoning the traditional approaches that continue to work well. Stay up to date on the latest trends in advertising. Contact MDG Advertising today at 561-338-7797 or visit mdgadvertising.com.